This week I am more certain than ever of the crack I was smoking. Seriously, does anyone else have such denial over what their schedules are and are not? Let me tell you what actually happens in the Smitten Kitchen most nights of the week: My husband, being management and all (I tease), leaves work at 5 p.m. but first asks me if we need anything from the store. I IM him some goofy aspirational shopping list in segments (“this is for dinner,” “this for a side dish,” “and these are for the frozen yogurt I am making for dessert,” “and this is so I can get a head-start on the cake I am baking this weekend!”) and then actually end up leaving the office at 6:30 p.m., running two errands, coming home dead exhausted and always a bit winded from four flights of stairs to a neat cluster of grocery bags on the kitchen floor and say meekly “Order sushi?” Because if there is anything I am not going to be starting at 8 p.m. on a Tuesday night, it’s dinner. And a side dish. And frozen yogurt. And cake. I know I may have accidentally given the impression that I cook dinner every night, but what I actually meant was “three times” and “on a good week.” Meanwhile, the web is bursting with tools and recipes that aim to find for us working stiffs some happy medium between coq au vin (we ate dinner at 10 p.m. that night. TEN.) and “pierce holes in the plastic and microwave for five to seven minutes”–oh, and Kung Pao Chicken–but most of them are such a mess of unnecessary cop-outs and cutesy (because, you know, if it’s not “cute!”, it won’t appeal to women, duh) titles that its hard to wade through and find the good bits. Beyond that, our culture’s worship of the “quick-n-easy” over the engaged and rewarding has always deterred me. I want a life bursting with complex activities and entrancing conversation, not shortcuts and quick-fixes. I actually enjoy the process of cooking as much as the outcome; I think if you get in the mindset that your only goal is to get from Place A to Place B, you miss too much. And I like getting my hands dirty. Just not last night, you know? This may seem an unseemly amount of chili powder, but it makes the flavor jump right off the plate with a minimum of ingredients. Plus, the mahogany-garnet hue in the photo was exactly what made this recipe call to me. It was even prettier in person, despite the horrible photos above. Place a large Dutch oven or saucepan over medium-high heat. Add the beef or turkey and cook until browned, about 5 minutes. Add the onion, stirring well, and cook until translucent, 3 to 5 minutes. Add the garlic and cook 1 minute more. Gradually add the broth, scraping up any browned bits from the bottom of the Dutch oven. Stir in the chili powder, cumin, cocoa and tomatoes. Reduce heat to medium-low, cover, and let simmer for 10 minutes. Add the beans, salt, and vinegar, stirring well. Simmer uncovered for 10 minutes more. Adjust flavor with your spices of choice. Garnish with the Cheddar, sour cream, and jalapeno, if desired. Serve hot, with corn bread, if desired. Horrible photos? Where? this looks deee-vine! I totally know what you mean – I write out my menu at the beginning of the week with full intent to cook every night – I think I average about 3-4 times a week. Your chili looks wonderful! This recipe is quite similar to the one I use. When I am making chili on a week night, sometimes IÃ¢â‚¬â„¢ll also throw in a can of fat-free refried beans. This really adds a Ã¢â‚¬Å“I stirred this pot all dayÃ¢â‚¬Â texture and taste. For a great, lightening-quick, and diet-friendly corn breadto go with the chili, copy and paste this link: http://www.foodnetwork.com/food/recipes/recipe/0,,FOOD_9936_20038,00.html?rsrc=search. IÃ¢â‚¬â„¢ve made this recipe countless times. It can always be zinged up with additions like cheese, honey, or jalapenos, but is just perfect plain and simple. I have to admit, the Cook’s Illustrated 30-minute Meals cookbook has changed my approach both to weeknight cooking and to “quick” meals in general. You know the snobs at CI aren’t going to skimp on quality or tell you to microwave anything that isn’t improved by microwaving… The Skillet Lasagna recipe is straight-up killer, and pretty much everything I’ve tried from there has made me feel like a hero for getting dinner on the table while it’s still light outside. I’ve bought at least a dozen copies now for gifts. promise. and look! now you have others do your bidding about the wading through the cutesy quick meals business. I’m glad I’m not the only one who has good intentions of cooking every night! And, dinner on the table at 10…yeah…guilty! i too do a menu every week. I only do 5 or 6 meals because I know that I will not cook every night. you have to leave room for left over nights you know. Just got done with the Ratatouille that I made today and it was wonderful, I have to say I took a few pointers from you. As from this post I adore you! I am reading all these fabulous blogs, drooling over fabulous pictures (yes, yours too), teething on fabulous recipes and thinking: “hey I can do that…but not now, not today. Well let’s say there are good days and bad and somewhere in between my family gets fed. – I know this sounds weird, but cook after dinner. We come home and are hungry, I heat what I made the day before, toss together a salad or side dish, and then we eat. At around 7:30. Then sometime after dinner, I cook something, a nice stew say, that will last us the next couple nights. -Also, we eat A LOT of seafood, a quick fish under the broiler is ready in about 10 minutes, we have that at least twice a week with some simple sides (roast potatoes, vegetables, salad). Mussels and seafood stew in tomato sauce are also fast. -Finally, cooking ahead on the weekend, leearn to love your freezer, and I’ll admit I’m super-organized and do meal planning, even if it’s only two of us. I think that, once it stops being so ungodly HOT here, I will have to try this, because my husband is always down on my chili, and I need to find a recipe that wows him. Or at least wows me, since all the chili I’ve ever made has been sort of “meh, take it or leave it.” But wowing him would be the Holy Grail since he is so freaking picky. sometimes i do the “cook after dinner” thing, too. it’s like reverse leftovers! if we don’t have anything leftover for lunch, i’ll sautee whatever vegetables are around, add a starch, and save part of it for dinner the next night. having salsa, cheese, or hummus around helps. This is very close to what I make (my Mamaw’s recipe) except she would never have tinkered with it (sometimes cocoa, sometimes cinnamon, sometimes beer, sometimes all three, sometimes who knows what). The best part is it’s quick and tasty (and even better the next day). Sure I make “exotic” or “designer” chilis when I have the time (mostly on my days off) but I work shift work so I never know if dinner is going to be at noon, 6pm, or 10 pm. Nonetheless my budding gourmet (where did that come from :-) ) 22 year old son still raves about (and requests) the old standbys frequently when he comes for supper. Simple, filling, flavorful recipes are where it’s at when you’re not blessed with lot’s of time. Cornbread is a must- crumble it over the top. Love the blog, love the recipes, but soon I’m going to have to start saving them to disk before I max out my harddrive! Oooh…delicious! I have to admit, the first picture made me think of an apple crisp a la mode. Someone once told me we see what we want to see. I think I believe them. Oh, are chilis are VERY similiar but I’ll sub the beef for turkey and boca combo. Very filling. Also, do you use red tobasco or green. I’ve been digging the green for a while now and I love the tingle on my lips. OH, and individual crocks to serve it and topped with cheese and onions. With corn cheese pones. Yeah, so on the upcoming week meals, before they forbid me to cook for two weeks. BOOO on them! Though it’s quite frankly too dang hot to cook. I ate half a block of cold tofu with soy sauce and a handful of sugar snap peas for dinner. Can I call that Japanese cuisine? The pictures on this site were good, now they are great! Everything you now do (even when I know I donÃ¢â‚¬â„¢t like an ingredient) is inspirational. Here dining at ten is the usual. I dine at nine, and people consider me an outlandish freak. And people leave their offices at 7 or 8, every day. I canÃ‚Â´t understand how anyone puts food on the table. Viva el frelance. – My husband and I both love leftovers. – My husband likes to cook and is a teacher, so he has summers off. Hallelujah. But, when I have a turn at cooking, it irritates me when recipes give NO indication of how long the whole thing takes. Or when there are 4 numbered steps that each have 12 substeps. What the heck? How do I know if I want to invest in this recipe? I’m looking at you, Cooking Light. That aside, I say “Amen!” to chili, especially with an addition of black beans. Our usual recipe is a slow-cooker number that makes enough for a week, but this quick version looks great to me! I plan out my weekly menu every Saturday morning before I hit the farmers market and the supermarket, but there are always nights when my 25 mile commute takes 1 1/2 hours and I just don’t want to do it (and cooking usually relaxes me when I get home). I’ve gotten really good at planning simple, delicious meals that I can get on the table in about 30-45 minutes. Mostly stuff on the grill right now b/c it’s been rather hot. Cutting back on time doesn’t have to mean cutting back on deliciousness or presentation. It’s not chili season now, but I’ll have to give your version a shot this fall. Thanks for sharing that! I actually did think you cooked every night, which made me feel quite slovenly in comparison. I do good to cook three nights a week. At least one of those is cooking with extra chicken or something that I prepared for another meal. Sigh. It’s hard when you work full time to do all that you want to do! Laundry has to be done, groceries procured, etc. Again, thanks for sharing. Mercedes! I was going to say the same thing! Last night I reheated baked chicken and brussel sprouts while spending 2 hours on Chicken Tikka Masala. And boy it’ll be worth it tonight! Ah, Deb, thanks for the “hall pass”. When I started my food blog, Smitten Kitchen set the bar for what I thought had to be done. I was, indeed, under the impression that you cooked morning, noon and night. :) So I tried to do the same. I fell flat on my kitchen floor after the first week, exhausted and begging for the yellow pages to call for delivery (and deliverance). I now use batch cooking to power my blog. It’s so liberating to know that you too do not cook every dog gone minute of your free time. One of the things I tend to emphasize in my own blog is fast, simple food. Not a lot of pre-made stuff, but I really believe that you can eat amazing food and not spend all your time slaving away. Deb – here is a question for your next round of q&a. Can you give a “how-to” guide for a mandoline slicer? I just bought a used one and it doesn’t have instructions…and I confess that I am intimidated by it. mmm….chili. chocolate in chili is one of my favorite new realizations over the past few years. My boyfriend and I tried your chili recipe last night. We make veggie chili all the time, but had never attempted a meat version and had been wanting to try one with turkey for ages. I ended up adding some bell pepper and doubling the tomatoes just because my personal chili preference is for heavier tomato influence, but the final product was great. Thanks for giving us something to work with! I am totally with you on this one. My fiance leaves his job at 4:30 (!!!) and is able to get to the gym and back before I am even thinking about leaving the library. Add the evening commute and by the time I’m home, I can’t even think workout or stove. Plus, I have way overblown expectations (still!) and taunt myself with my weekly menus which are taped to the fridge and stare me in the face as I go for another bowl of cherries and the box of Triscuits(not in the fridge, but you get the gist). I did, however, get a chance to make your fabulous 3 bean chili last weekend and we really, really loved it. It’s hard to find a vegetarian chili recipe without all kinds of god-awful additions (I love eggplant and zucchini as much as the next person, but, really) and with that nice, hearty, maroon ooze. I was scraping the sides of my bowl. We also really enjoyed the cornbread recipe–I added sauteed onions, which I never had done before and it was really tasty. I felt like a genius! Thanks! I’m new to this site and just wanted to say that I love the recipes and can’t wait to try some of them. It’s getting late … but I can’t stop browsing! This looks wonderful. After a long night at work and a long hot shower to rid myself of the scent of seafood, I could definitely use some chili. I love your blog!! The same thing happens with the groceries for me. So I make the decision not to buy them until the day I’m using them, but then I end up taking so long shopping and doing other things that I’m too worn out to actually make anything. happen at least 3 times a week. i have a very different chili recipe that i use (actually a bastardized vegetarian recipe that i put meat in) that i make often because it gets rave reviews. i never thought to put cocoa powder in it! i happen to have some now so maybe i’ll give it a whirl next time i make my chili! I made this this weekend! It is very yummy. I put half in the freezer for a later day and half for lunches/dinners this week. thanks DEB! You’re helping a new (puppy) mom keep her sanity!! (If I only new what that means) but the night seams to go by faster & faster. I wish time is what prevented me from cooking a glorious dinner every night. For me it is lack of funds to buy all the goodies I want to cook and kids who wouldn’t eat it anyway. I must admit that somedays my ability to scrounge a tasty dinner out of what is in the fridge is a little scary, but it happens quite often. I’ve been meaning to make mussels as an “easy week night meal” for two years now. I hear you sister! If I could make one minor suggestion – instead of using plain canned tomatoes, consider using a jar of your favorite prepared salsa – heat level of your choice. You add flavor with the tomatoes. Mmmm. How delicious. I love a hearty, spicy chili—especially this time of year. 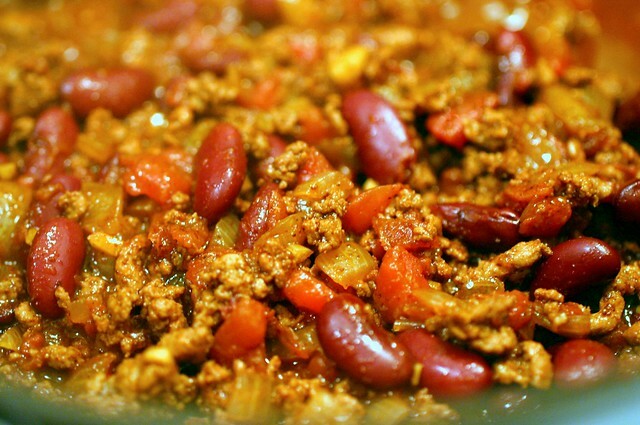 Have you ever tried “Skyline” aka Cincinnati-style chili? It’s different, and amazing—plus, you get to eat it on spaghetti! I’ve been admiring your site for a long time and have made several of your recipes. Your photos are stunning. Thanks for being such an inspiration! I have made this with Lamb and it was wonderful… A big hit with lamb lovers like me. I just made this (along with the caramelized onion and goat cheese cornbread). It’s very tasty, but I think next time I’ll leave the cocoa out. Chocoholic that I am, I still find that the cocoa softened the bit of the tomato tangyness more than I like. If you want your chili really, really smooth tasting, though, cocoa is the way to go. Now that I’m in a Mexican frame of mind, I think I’ll run off now and see if Deb has enchilada or mole sauces on the site. Aww, I just looked and can’t find either an enchilada sauce or mole sauce recipe on SK. Waa! I shouldn’t complain, though; up to now I’ve found just about everything I could think of here. But Deb, how about it? Got anything in that pile of untried recipes? You should check out Homesick Texan or FoodBlogSearch for mole and enchilada sauces. I’m sure you’ll find plenty of good ones! Yum! I love chili and like to try new recipes all the time. I’ve never made it with cocoa before, so I’m going to make this soon! Help – what did I do wrong? This was the hottest chilli I’ve ever had in my life! I am so impressed with everyone’s ability to eat spicy food. Or yaybe the chilli powder get have in the UK is hotter than you get in USA? Very well might be the chili powder you have. The stuff here only gave this a light/moderate kick. I got a delicious recipe for chicken mole from Cooking Light magazine years ago (you can tell the good recipes because they have food smears on the page!). I would bet you can still dig it up on their website….It uses a banana to thicken it. I lost the recipe once, and that was the vital piece of information I used to track it down. I know it sounds weird, but I’ve never been able to taste it in the finished product, and no one else has ever told me they can, either. Even the picky eaters, even when they’ve seen me put it in. Give it a try! But I digress. I take it back about leaving the cocoa out. As always, the chili ‘matured’ overnight and the next evening it was as clear as my reflection in the bottom of the bowl that the cocoa made a huge difference. Since then I’ve made the chili again, only this time I let some red and yellow peppers get sweet with the onions before adding the rest of the ingredients. It ruins the purity of the unapologetic meatiness of the original, but tastes mighty good. This time I also modified the cornbread by adding canned diced green chilis to the slowly-sauteed onions and mixing them all into the cornbread. Deb, you’ll make me into a cook yet! I just made this without meat and it was fantastic! Was so glad to have found this when I was jonesing for chili with about an hour to go before kick-off. It was a big hit! Would you believe that is almost exactly the same “recipe” I use for my chili. I put recipe in quotes, because I don’t write it down. It turns into more of a little bit of this, little bit of that kind of deal sometimes. I have never tried the cider vinegar though. I guess I will have to give that a shot. Anyway, I love this recipe, and was thinking about making “my version” for a local chili cook-off this fall. This was absolutely the hottest chili I’ve ever had (apparently I have super hot chili powder), but it was also delicious, just inedible in the straight from recipe form. So, I added 2 large cans of tomato sauce to thin it out as well as an extra tablespoon of cocoa. This gave it the perfect amount of heat and it was great. Next time I’ll try cutting the chili powder to about 1/4 of a cup and see how that does. Any suggestions for a dessert to go with this? This recipe will sure fire some dinner dates and eat together with my family! Let see if they can handle this! Thanks for the idea and might as well try this asap! I made this chili for a New Year’s party last night, and it was a huge hit! I was worried about putting all of that chili powder in, but you were totally right – it doesn’t end up being too spicy, and it just really brings out a wonderful flavor. I added in some diced green pepper in addition to the onions, and it came out nicely. Several people asked me for the recipe and I pointed them all to your site! Thanks for a great recipe, as always! Just made this tonight…delish! We halved the recipe and it turned out great! I, too, never make chili without chocolate. Recently I switched to dark chocolate powder and it’s a welcome improvement. Tonight I added dried cilantro; so far, so good, as it’s still bubbling on the stovetop. I use red, dark red kidney beans and black beans as well. I ask no forgiveness for that! The best chili I’ve ever made! Whipped it up Tuesday to eat all week, being a busy at-home mom, military wife and online college student. Thank God my family doesn’t like chili, because I have no intention of sharing! The addition of cocoa was a first for me, though I’d seen it done before. I’ll never make chili without. Thank you! While I have been a long-time reader, I must admit that this is the first recipe I have tried from the Smitten Kitchen. I thought it was absolutely wonderful! I will admit, skeptical about the amount of chili powder but it worked out great. We had some chipotle chili powder sitting in the spice drawer, so I used half chipotle and half standard. The chili was spicy, but in a great smoky way. I whipped up some buttermilk cornbread to pair it with, and it was an amazing dinner. I think I should reduce the amount of cumin. My entire chili tasted like cumin. OMGosh. This post makes me feel so much better about life. Good to know I am not alone. I don’t think I have ever said this before in my life…but it needs more tomato! Thank you for saving my chili! I have a big pot of chili in the slow cooker for tonight’s dinner. A short while ago I was staring at the chili, thinking, “this isn’t juicy enough”. So I came and googled photos of chili and saw that, yup, my chili was MUCH too dry. Then I googled “Smitten Kitchen” and “chili” and found this. As I type my printer is spluttering out this recipe – which will now be my new go to recipe for chili & I’ll be heading out to the store to buy some beef broth! THANKS! Hi! I made this a few days ago. It was fast and easy. It took me about 20 minutes. I am still thinking about this dish and wondering how long I should wait before making it again. I am making your recipe for beef/barley/leek soup tonight. All your photos are beautiful, by the way, and a big part of what inspires me to go shop for the ingredients and make time to cook. Thanks! Vegetarian and chili virgin with a grad student kitchen, I swapped beef for TJ’s soy chorizo, beef broth for vegetable stock, and apple cider vinegar for red wine–>addicting chili. Great recipe. Thanks! This was AMAZING and will enter into our regular dinner rotation! I made a veggie version using 2 packages of Yves ground round, and used the whole can of tomatoes (to make up for the richness imparted by beef). I also used veggie stock. I added the onion to the pot (before the fake meat), because the fake meat is pre-cooked anyway. I used a bit of oil to prevent the onion from sticking. I used 1/4 cup of chili powder because the Yves stuff is a bit pre-seasoned. We served over brown rice and mmmmed throughout the whole meal! how much does this serve?? what is the difference between chili powder and cayenne in this recipe? Chili powder is a spice blend (you might be thinking of chile powder, which would be from ground dried hot peppers) that often contains cumin, paprika, cayenne, garlic powder and oregano. My boyfriend made this tonight and it was absolutely delicious! He also added a teeny bit of cinnamon, but otherwise stuck to the recipe. I’m looking forward to the leftovers. We made this for a party last year and it was a hit; so much so that we ran out! How many people does this serve? We will need to double or triple the recipe for this year’s inauguration party so I want to get the amount correct. Thanks! Just made this for the first time with the tomatoes doubled (we like tomatoes) and it was perfectly delicious! It is now my go to beef chili recipe, thank you! I actually do cook almost every night, if you count reheating leftovers. The general plan for the week is to cook a lot of food for Sunday dinner, which reappear in various guises throughout the week. Creative leftovers! During the week I usually find myself calling my husband at work at 7:30 to tell him I’m starting dinner. His usual response is “Is it that late?” Dinner is never earlier than 8 p.m. Thank you so, SO much for letting me know I’m not the only one who has served dinner at an outrageously late hour. I’m quite serious when I say this made my day because it’s one of the things I’ve beat myself up for many times. p.s. – this is on the menu for tonight at 8pm (this is legitimate, as my bf works nights). Can’t wait to try it. I cooked this chili tonight and wondered if you put oil in your Dutch oven before browning the meat? I didn’t at first, and it didn’t work very well. The turkey stuck to the pot, so I slicked it with olive oil, and that seemed to clean it up. Just wondering if you liked the meat to stick to the pan so you get some more brown bits later or if you do actually oil the pan before browning the meat. Hi Claire — I used beef, and don’t remember it sticking too much. However, beef is much more oily than turkey and I’m thinking that oil would be helpful if using the turkey, something I should have considered … the 6+ years ago I shared this! (Whoa.) Fortunately, you could just “deglaze” with the tomatoes and other ingredients, right? My family decided this tasted more like the filling for a burrito than what we think of as chili [soup]. I think it was because we ended up with a strong taste of cumin. In reading through the posts on this recipe I caught your response concerning how using a different chili powder would effect the “kick”, I would think different chili powders would have different percentages of cumin as well. If anyone else finds they have the same difficulty we did, take heart. I am going to keep the recipe as published in my box as it does make a delicious burrito filling. This looks good , I have to say I’m shocked there’s cocoa in chili. It’s not an ingredient people would think would be in chili. Please be aware some people are allergic to cocoa and would never think to mention it in chili. If you make this for someone who you don’t know. Check their cocoa allergy. This has happened to me before. Someone made oatmeal cookies and added cocoa to the batter. I was sick for a week. This was kickin! I used crumbles and made it vegetarian. Even threw in a can of black eyed peas in place of one of the cans of kidney beans since I made this on New Year’s Day. Good luck for 2015! I made this tonight and it was great! I was a bit wary of the amount of chilli powder (like a lot of others it seems) but it wasn’t too spicy, just a pleasant burn. Had it with brown rice but I might make cornbread next time. By the way, I only had one can of kidney beans, so I used pinto beans in addition and it worked just as well! Sounds good, I would try add one celery rib and 1/2 bell pepper chopped to this. I love this recipe. I’ve been using it for years with some slight differences, and have finally gotten to the point where I’m not looking up the recipe just to double check that I remembered everything! So I just want to say thank you for all your wonderful, amazing work! Could you make this in the crockpot if you have endless hours of free time? Why Cocoa and vinegar? What do thos do? My guess, cocoa for depth of flavor and vinegar for tang? I’m making your pasta broccoli wt Turk sausage today, those two dishes ought to last us the week! I want to say this dish is “more than the sum of its parts,” but I think some of the parts — especially the cocoa, chili powder, and cider vinegar — are responsible for making such a delicious final product. I used 90/10 turkey and water instead of broth (lazy) and this still had plenty of flavor. I usually prefer more tomatoes in my chili, so I may make that modification next time. But I highly recommend this recipe to anyone who enjoys a nice, hearty, relatively quick chili.